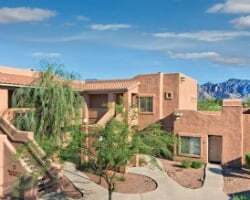 Discover the majesty and beauty of Oro Valley with your very own timeshare at WorldMark Rancho Vistoso. Explore discounted timeshare resales and rentals at the resort with SellMyTimeshareNow.com. Flanked by scenic copper hills and beautiful desert plant life, the WorldMark Rancho Vistoso is a luxurious vacation resort that will fulfill all of your wants and needs. Tucked away on the outskirts of Tucson, you'll find your retreat at the Rancho Vistoso puts you close to all of the area's best and most beautiful attractions. Enjoy the swimming pool on hot desert days, or soak in the hot tub at night underneath a mass of twinkling stars. With a full-service fitness center, an arcade, tennis courts, and so much more to offer, the Rancho Vistoso WorldMark provides a one-of-a-kind retreat guaranteed to provide you with exciting vacations year after year. Accommodations at the resort include convenient studio units as well as spacious multi-room suites with enough room to sleep up to eight guests. Perfect for family trips as well as quaint getaways for couples, the WorldMark Rancho Vistoso's suites combine effortless luxury with optimal convenience to create a relaxing stay. You'll find your timeshare unit at the resort comes complete with air conditioning, a private balcony with a barbecue, laundry machines, and more to ensure you have everything you need for a home-away-from-home. 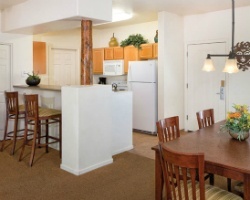 Are you ready to find your very own accommodations at the WorldMark Rancho Vistoso? Fill out the form on this page to learn more about the resort, or call a representative at 1-877-815-4227. Owning a timeshare resale at the WorldMark Rancho Vistoso will enable you to embark on great trips to Arizona each year for thousands less than what other timeshare owners pay. The secret lies in the secondary market—current timeshare owners at the resort sell their units if they're done using them, giving travelers like you an opportunity to save. Because timeshare resales aren't sold by the resort, prices are often much more realistic and open to negotiation. You could end up saving as much as 70% when you buy a timeshare resale at the Rancho Vistoso, allowing you to keep more money in the bank for other expenses. Resales at the Rancho are often available in the form of WorldMark by Wyndham points. Timeshare resale buyers can use their club points to make yearly reservations at the WorldMark Rancho Vistoso whenever they want, through WorldMark's Red and White seasons. What's more, you'll have access to a host of incredible owner benefits as a WorldMark resale buyer. The Rancho Vistoso resort is affiliated with WorldMark by Wyndham, a large and well-known vacation ownership brand. Being a resale owner at the WorldMark Rancho Vistoso means you'll have direct access to some of the brand's best owner benefits. For example, you can explore the globe and travel to destinations outside of Arizona by spending your points at other WorldMark resorts. Travel to Oro Valley one year, but choose California, Canada, or even Australia the next. Plus, there are many more exclusive owner perks within WorldMark, The Club that you'll be able to experience. The WorldMark Tucson Rancho Vistoso is also a part of the RCI timeshare exchange network, the largest of its kind in the world. An RCI membership can enable you to travel the globe one timeshare trade at a time, broadening your horizons and opening the door to new experiences. All you need to do is deposit your Arizona accommodations into the exchange network and choose from a list of comparable properties to trade your timeshare. Additionally, the Rancho Vistoso is a Gold Crown resort, noting its superior amenities and services. This ensures you'll be guaranteed a luxury stay no matter where you exchange. You'll find no shortage of things to do around the resort, as the Rancho Vistoso is loaded with fantastic on-site amenities and services. Start off at the resort's swimming complex, which features an outdoor pool, a splash pad, and a hot tub. Kids will find the playground to be entertaining and fun, while adults can work out at the fitness center to stay on top of their exercise goals. The tennis courts are available for some quick recreation, while the pool and ping pong tables are great for friendly competition. Surrounding the resort, all the charms of Oro Valley are yours to discover. Embark on horseback riding or ATV tours through the rugged desert landscape, or set out on foot to hike the Santa Catalina Natural Area. Glimpse relic aircraft at the Pima Air & Space Museum, or travel to Historic Downtown Tucson to take in the unique culture. Stop in at Tombstone for a dose of folklore, or check out Biosphere II to tour a self-sustaining model of planet Earth. 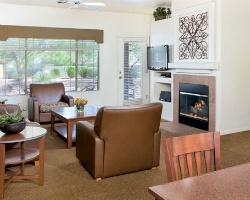 Already Own at WorldMark Rancho Vistoso?